The seaside town of Blackpool, situated on the north west coast of England is noted for its Tower and its Illuminations that are switched on each year in September at the end of the traditional summer season. To the transport enthusiast Blackpool is famous for its trams, which have been running along the promenade since 1885. This video programme brings two of the above elements together – the trams and the Illuminations in this rather unique programme filmed entirely at night time during the five evenings leading up to the celebrations for the system’s 125th Anniversary. The three special ‘Illuminated’ trams are 737 ‘The Trawler’, 736 ‘The Warship’ and No. 733 & 734 locomotive and carriage making up the ‘Western Train’, which has just undergone a major refurbishment with a Lottery grant to bring it back to its 1962 condition complete with sponsorship for the erstwhile ABC Weekend Television. Apart from these three icons of the Blackpool tram fleet that feature in this programme, we film all of the other trams running in service over the evenings. As well as the standard Blackpool fleet, trams from the historic fleet including Marton Box 31, Standard 147, Coronation 304 make an appearance. Trams from other systems also appear including Sheffield 513 and Stockport 5 and others. We start filming at the North Promenade moving to North Pier, Central Promenade and on to the Pleasure Beach. There is plenty of action for you to enjoy with the marvellous Blackpool Illuminations as a colourful backdrop. Our cameras then take a tour of the Illuminations on board the superbly restored ‘Western Train’. The tour starts at the North Pier and goes by way of Bispham, the Little Bispham turning circle, along the Promenade turning at the Pleasure Beach and returning to the North Pier. We film both on board and line side for you to experience this fantastic trip on a very special tram. 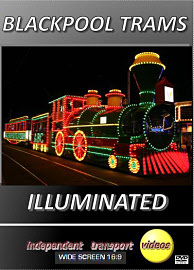 We hope you enjoy our special Blackpool Trams Illuminated programme!